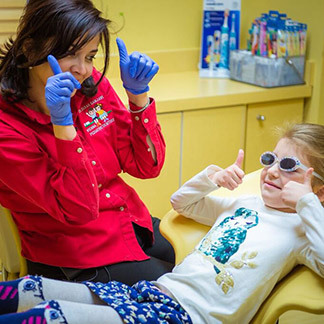 Psst... Vienna Pediatric Dentistry Rocks! We want to thank all of our patients for your support over the past 10 years. Your referral of a friend, family member or co-worker is one of the greatest compliments we can receive. Those casual conversations with friends, co-workers and neighbors can have a tremendous impact on their decisions regarding their child(ren)’s next dental health care provider and our ability to provide them with those services. Some of our best patients come from our wonderful existing patients, so if you are happy with us, we encourage you to tell all of your friends, family and co-workers about Vienna Pediatric Dentistry. We welcome them to become a part of our practice. As a way to say thank you, we will automatically enroll you in our Patient Referral Rewards Program. This program allows you to refer your loved ones, with the opportunity to benefit from it. Our Patient Referral Rewards Program is unlike any other you've seen or participated in. You can help a friend make a great and well-informed decision about their child’s dental care. You can be sure that they will receive the same quality care your child has received in our office. In a world where services are abundant, your first-hand experience and recommendation will have a direct impact on someone else's decision regarding those same services. Wouldn't it be nice if you had a trusted friend recommend the provider of all of the new services you seek and receive? We have redesigned our Referral Rewards Program to allow for the opportunity to get some great gifts for both the referrer and the referee! What’s in it for friends, coworkers and neighbors? Your referral will give your friends and neighbors a way to feel confident in their decision to use our services for their child(ren). And did we mention they get a gift as well? We will welcome all new families that have been referred by an existing patient with a battery operated toothbrush! There will only be one toothbrush gifted to each new family. These gifts cannot be exchanged for cash. All existing families. We treat patients from ages 0 to 18 years old. Employees and their immediate families are not eligible. A "referral” is a patient of a family who is not currently an existing patient of our practice. We base our Referral Rewards Program off the number of families an existing patient refers. Each month, we will check the new patient list for referred patients that have been seen in our office. If you referred your first new patient/family of the year you will receive a Vienna Pediatric Dentistry travel mug and a $5 Starbucks gift card. Rewards will only be given out after the new patient’s first appointment. So, I got my travel mug. Now what? At the end of the year we will total up the number of new families you referred and will distribute gifts according to our tier system. Refer 1 family and receive a Vienna Pediatric Dentistry beach bag! Refer 2 families and receive a $50 Visa gift card! Refer 3 families and receive a family 4 pack of movie & popcorn tickets! Refer 4 families and receive $100 Great American Restaurant gift card! Refer 4 or more families and be entered to be in a drawing for a free ipad mini! Don't forget! Every January our program will “refresh,” so try to get in as many referrals as possible from January through December. Cash prizes will only be given in person to the individual earning that prize. Expiration dates may apply. It is up to you to use these by all expiration dates. Cash prizes will be subject to IRS rules and regulations. We reserve the right to change the rules and modify prizes at any time.